Ohio Valley Christian sophomore Arden Peck (right) runs off of a screen set by classmate Levi Anderson (34), during the Defenders’ 65-19 loss on Tuesday in Gallipolis, Ohio. OVCS junior Andrew Dubs (22) shoots a two-pointer in front of freshman Bryce Gruber (11), during the Defenders’ 46-point setback on Tuesday in Gallipolis, Ohio. GALLIPOLIS, Ohio — From the word go, the Golden Rockets were a forced to be reckoned with. 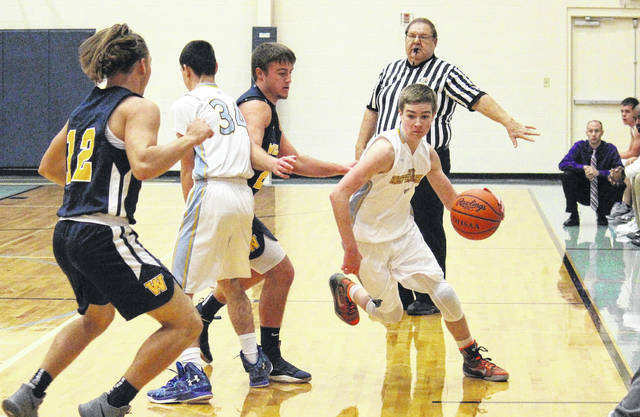 The Wellston boys basketball team scored the first 19 points of Tuesday night’s non-conference bout in the Old French City, and the visiting Blue and Gold rolled to a 65-19 over Ohio Valley Christian. 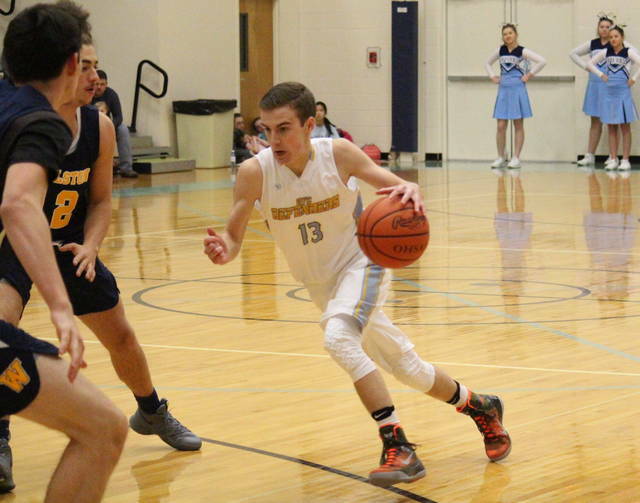 The Golden Rockets (2-2) nearly held the Defenders (1-6) off the board in the opening quarter, but OVCS junior Justin Beaver hit a buzzer-beating three-pointer from well behind the line, making the WHS lead 19-3 at the end of the stanza. Ohio Valley Christian had its best offensive quarter in the second, scoring 11 points on a trio of field goals and a quartet of free throws. However, Wellston poured in 20 points in the second, making its lead 39-14 at the halftime break. 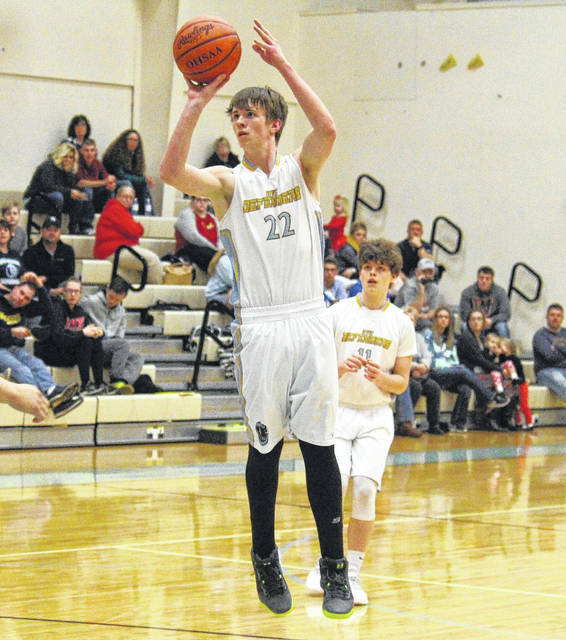 The Defenders scored three of the first five points in the second half, but Wellston ended the third quarter with a 11-0 run and a 52-17 lead. In the final stanza, the Golden Rockets outscored OVCS by a 13-2 clip, sealing the 65-19 win. In total, Ohio Valley Christian shot 6-of-43 (14 percent) from the field, including 2-of-11 (18.2 percent) from three-point range. Meanwhile, Wellston was 25-of-75 (33.3 percent) from the field, including 6-of-28 (21.4 percent) from beyond the arc. From the free throw line, OVCS was 5-of-11 (45.5 percent) and WHS was 9-of-17 (52.9 percent). The Golden Rockets outrebounded the Defenders by a 54-to-25 count, including 24-to-4 on the offensive end. Wellston earned advantages of 12-to-2 in assists, 20-to-5 in steals and 7-to-5 in blocked shots. Collectively, the Defenders committed 31 turnovers, while WHS gave the ball away just eight times. The OVCS offense was led by Beaver with 12 points on two three-pointers, a pair of two-pointers and a 2-for-3 performance from the free throw line. All-12 of Beavers’ points came in the first half of play. 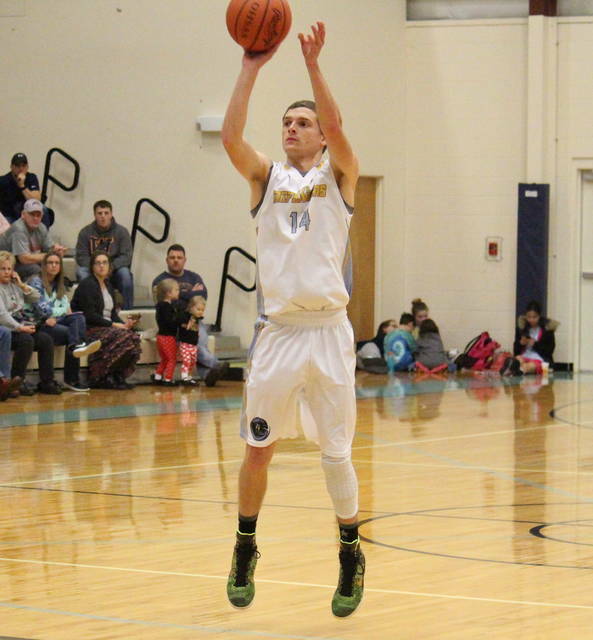 Ohio Valley Christian junior Andrew Dubs scored four points, using one field goal and two free throws, while senior Asher Peck sank a field goal for two points. OVCS freshman Bryce Gruber rounded out the Defender scoring with one point in the setback. Beaver, Dubs and Christian Higginbotham had four rebounds apiece to lead the hosts on the glass, while Gruber and Higginbotham had one assist each. Sophomore Arden Peck led the OVCS defense with two steals, while Beaver had a game-best four blocked shots. With 10 players in the scoring column, Wellston was led by Decota McKenzie and Jordan Lucas with 13 points apiece. Matt Simpson recorded a double-double of 10 points and 12 rebounds, while Jase Arthur scored seven points and Michael Graham added six points. Rylan Molihan, Brice Randolph and Donnie Watters each had four points in the win, while Josh Bodey and Eddie Smith marked two apiece for the guests. Lucas made a team-high two three-pointers for WHS, while Arthur, Graham, McKenzie and Randolph had one trifecta apiece. Graham and Lucas both dished out a trio of assists in the win, Graham and Arthur had four steals apiece, while McKenzie blocked three shots. The Defenders won’t have a chance to avenge this loss, as this was the lone scheduled meeting between WHS and OVCS this winter. Ohio Valley Christian will try to snap its four-game skid on Friday when the Defenders welcome Parkersburg Christian.